Thank you Rich for sending these facts. As a young boy, I remember my grandfather who was born in the Austro-Hungarian Empire telling me stories about the Turks invading Europe. They over took Budapest and occupied Eastern Europe for hundreds of years before they were beaten and driven out. > The war started in the 7th century and lasted through the 17th century. I would contend it never stopped but historically the facts below are correct. > This is why I choke when I hear someone say we will defeat or contain these Islamic terrorists in a few years or even 30 years as recently stated by Leon Panetta. > If the latest batch of murders, beheadings, and killing of innocent Christians has shocked you, maybe you should read this compilation of historical facts about Muslims. > In 1571 A.D., the Muslim Army/Navy was defeated by the Italians and Austrians as they tried to cross the Mediterranean to attack southern Europe in the Battle of Lepanto. > In 1683 A.D., the Turkish Muslim Army, attacking Eastern Europe, was finally defeated in the Battle of Vienna by German and Polish Christian Armies. > This crap has been going on for 1,400 years and half of the politicians don’t even know it. > If these battles had not been won, we might be speaking Arabic and Christianity could be non-existent; Judaism certainly would not exist. > A lot of Americans have become so insulated from reality that they imagine that America can suffer defeat without any inconvenience to themselves. > Pause a moment and reflect back. > These events are actual events from history. They really happened! > 1. In 1968, Bobby Kennedy was shot and killed by a Muslim male. > 2. In 1972, at the Munich Olympics, Israeli athletes were kidnapped and massacred by Muslim males. > 3. In 1972, a PanAm 747 was hijacked and eventually diverted to Cairo where a fuse was lit on final approach. Shortly after landing it was blown up by Muslim males. > 4. In 1973, a PanAm 707 was destroyed in Rome, with 33 people killed, when it was attacked with grenade by Muslim males. > 5. In 1979, the US embassy in Iran was taken over by Muslim males. > 6. During the 1980’s a number of Americans were kidnapped in Lebanon by Muslim males. > 7. In 1983, the US Marine barracks in Beirut was blown up by Muslim males. > 8. In 1985, the cruise ship Achille Lauro was hijacked and a 70-year old Jewish American passenger was murdered and thrown overboard in his wheelchair by Muslim males. > 10. In 1988, PanAm Flight 103 was bombed by Muslim males. > 11. In 1993, the World Trade Center was bombed the first time by Muslim males. > 12. In 1998, the US embassies in Kenya and Tanzania were bombed by Muslim males. > 13. On 9/11/01, four airliners were hijacked; two were used as missiles to take down the World Trade Centers and of the remaining two, one crashed into the US Pentagon and the other was diverted and crashed by the passengers. Thousands of people were killed by Muslim males. > 14. In 2002, the United States fought a war in Afghanistan against Muslim males. > 15. In 2002, reporter Daniel Pearl was kidnapped and beheaded by a Muslim male. > 16. In 2013, the Boston Marathon Bombing resulted in 4 Innocent people, including a child, being killed plus 264 people injured by Muslim males. > No Obama, I really don’t see a pattern here to justify profiling, do you? > So, to ensure we Americans never offend anyone, particularly fanatics intent on killing us, airport security screener’s will no longer be allowed to profile certain people. > Absolutely No Profiling! They must conduct random searches of 80-year-old women, little kids, airline pilots with proper identification, secret agents who are members of Obama’s security detail, 85-year-old Congressmen with metal hips, and Medal of Honor winner and former Governor Joe Foss, BUT…….leave Muslim Males alone lest we be guilty of profiling. > Ask yourself, “Just how stupid are we? “Have the American people completely lost their minds or just their Power of Reason??? Look Out Idaho Here I come! The devil made me do it. Earlier this summer I left a potato on the counter top too long. I had it there waiting to use it with a dinner. One day I looked at it and it had all these green sprouts protruding from the eyes. The great experiment began. My mother taught me that if you plant the sprouting eye of a potato it will grow into a plant and produce more potatoes. Why not? I was late in getting my vegetable garden started, and potatoes are a vegetable, right? I carefully cut the sprouting eyes out of the Idaho potato and planted them, five in all. Sure enough, within a few days five green sprouts broke through the soil. I let them be. I paid more attention to the three varieties of tomatoes I planted. 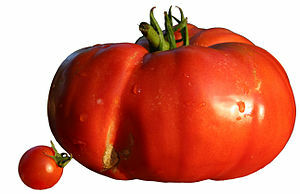 Of the three, the biggest crop came from the grape size tomato plant. The smallest crop came from Beefsteak, and the third, also called beef-something produced fruit that wouldn’t turn red on the vine. Last year, the grape tomatoes were sweet and flavorful. This year they were acidic and sour. The fruit on the beef-something distorted and resembled Siamese twins joined at the chest. I wrote a Halloween post about one of the beef-somethings called Graden Creature. Once a beef-something turned red it was tasty, but it required a lot of trimming of the stem and from the juncture and the distorted twin top. Visions of my Grampa Jim ran through my mind all summer as I waited for the potato beetle to come and devastate the five plants. 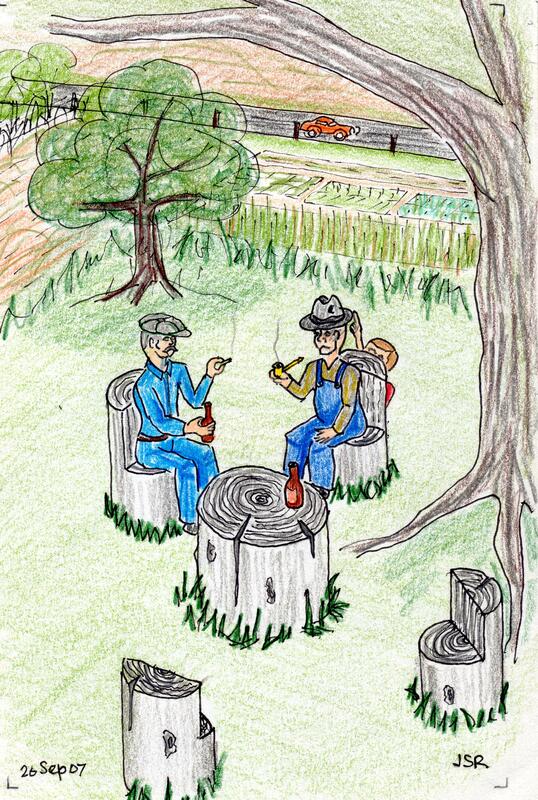 Grampa Jim invented the green movement of organic gardening. His method of eliminating the potato beetle was to tour the rows and pick the bugs off the plants by hand. He flicked them into a coffee can with kerosene. Often, when I scoured the shed for nails and tools, I’d look into a coffee can only to find an inch of kerosene in the bottom and a layer of bugs floating on the top. He didn’t waste his cans or kerosene either. Miraculously the potato bug didn’t arrive in my tiny garden. 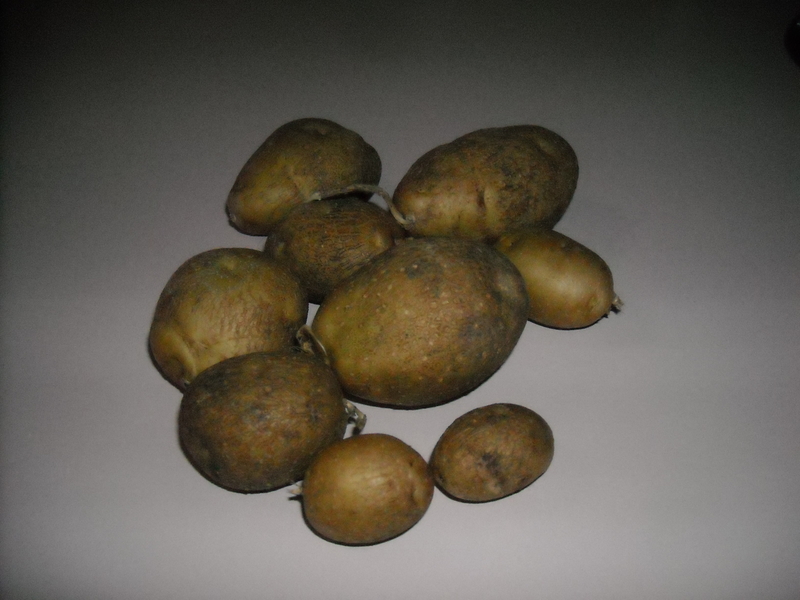 Last week, during garden cleaning, I finally harvested the potato crop. My heart raced with excitement as I dug for the tubers. Success, I found several under the first plant. These potatoes have a way to go to compete with the Idaho they sprouted from, but it is a start. Look out Idaho, Look out Maine, Grumpa Joe is adding potatoes to his crop. Filed under: Biography, family, Food, Garden, Gardening, Grampa Jim | Tagged: Agriculture, Beefsteak, Idaho, Kitchen garden, Maine, Plant, Potato, Tomato, United States |	Comments Off on Look Out Idaho Here I come! 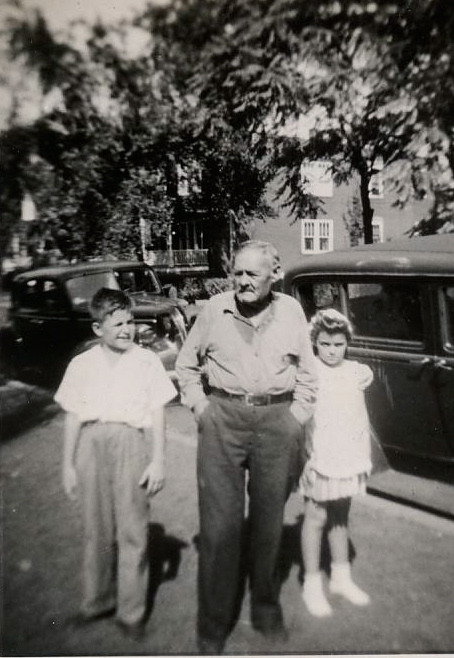 chronicled in a series of childhood memories under the category of Biography-Grandpa Jim. I am suffering through a period of melancholy the past few weeks, and today is no different. The fact that today is his birthday has nothing to do with my dilemma, but it adds to my sadness. The man was the only grandparent I knew. The father of my mother, he came to this country from Hungary to make a better life for himself. He landed a job in a coal mine in Southern Illinois near the town of West Frankfort. While mining coal, he was seriously injured and placed on disability. He received a pension of twenty-six dollars a month for the rest of his life; he managed to survive. 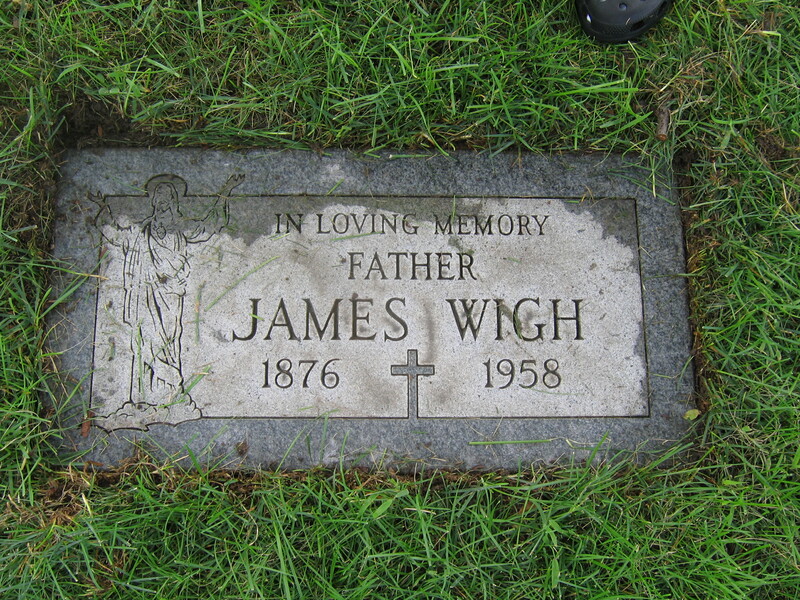 Grandpa Jim lived a solitary life on his farm in Michigan. As I have related before, he spent winters in Chicago by the command of my mother. She felt he needed to live a little easier than he did on the farm. When winter passed, and the weather got a bit warmer, Grandpa Jim disappeared. He found a way back to his humble little farm-house in Covert Township. Happy Birthday Gramps! Where ever you are. Grampa Jim was a loving and kind man who did anything he could for us. He was slim and short, only five foot two inches tall. His hair was grey and thin. 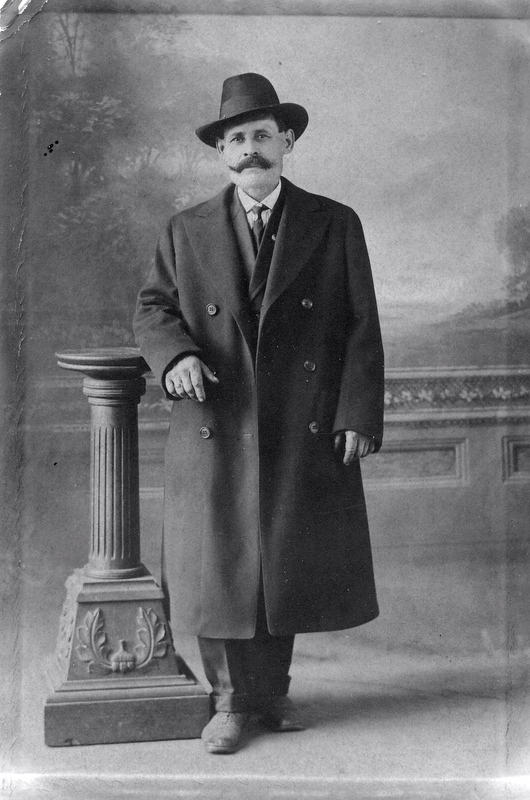 He sported a neatly trimmed mustache. On the left side of his face, right in front of his ear, he had a lump nearly the size of a golf ball. He never worried about the lump even though he looked funny with it. It never hurt him or bothered him in any way. My wish to go fishing got through to him, and he agreed to take me to Little Paw-Paw Lake to fish from a boat. Dad dropped us off. Grampa never owned a car nor did he know how to drive, but he always got to where he wanted to go by walking, and asking for rides. The lake comes up to the front door of the house next to the road. The owner rented row boats. Little Paw-Paw is unique in that power boats are forbidden. The result is that there are no water skiers or speed boats tearing up the lake. The lake is small, serene, and quiet. There are houses on the lake, but much of the shoreline is still wild and undeveloped. Gramps and I rented a boat, and I rowed out into the lake with my gear and a can full of worms. The water was smooth as glass. Only the wake of our boat and paddles disturbed it. Occasionally, a fish jumped nearby with a huge splash; making my adrenalin flow. A third of the way across the lake we stopped and set the anchor. I baited my hooks and swung out the bobber. I used the bamboo pole that Grampa Jim bought for me. I waited patiently for the bobber to dip. Here I was, fishing in the middle of the lake, in deep water. Oh how I had dreamed of this moment. I envisioned pulling in lots of fish when out in the deep waters. With all the fish jumping around us, I thought we’d see non-stop action; nothing happened. 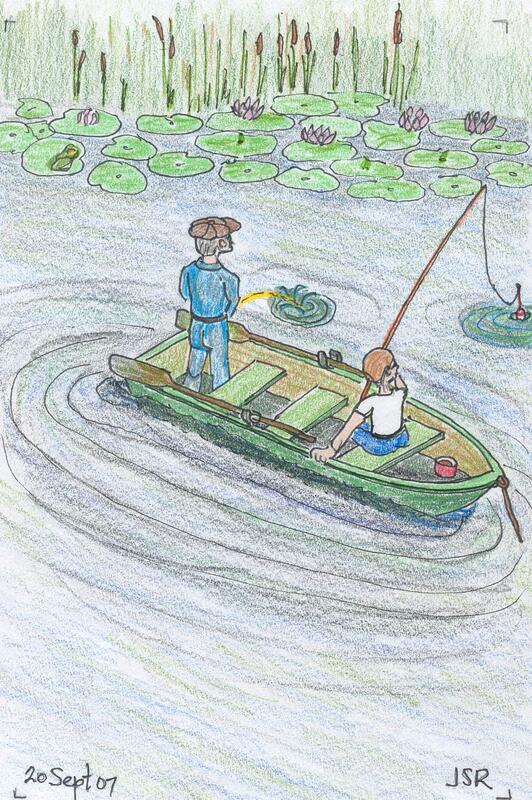 After awhile, I pulled up anchor and rowed to the lily pads near the shore. I read that fish lurked in lily pads. This time, we anchored about 30 feet from shore at the edge of the lily pads. We’re going to fill the boat with fish at this spot, I thought. Again, there were no bites; not a single one. Gramps started to get antsy. I was not a swimmer, so sitting in a boat was exciting enough for me. The least little bobble of the boat terrified me. Gramps couldn’t take it any longer, his bladder was aching. Suddenly the boat began rocking and rolling as Grampa Jim stood up. I hung on for dear life with visions of drowning. I hollered at him to sit down, but nature called him. He stood up straight, turned away from me, and took a whiz. I sat there holding on for dear life. He rocked the boat again when he sat down. I was frozen with terror. It turned out that Grampa Jim’s whiz was the most excitement I had that day. I didn’t get a single bite during four hours of fishing. Dad came to pick us up, and asked how we did. “There are no fish in this lake,” I responded. Grampa Jim didn’t say a word. Grampa Jim’s daily ritual to Fish Corners often left him coming home after dark. He socialized with anyone who came in and sat down with him. He sat at a favorite table, and everyone in the area knew him. It was almost as though he was the township Godfather. Most of the time, he got a home, but one summer night Gramps had to walk. His house was a long quarter mile away along a desolate road. There are only two houses between the tavern, and the farm; both of them are immediately behind Fish Corners. After that, the woods grew out to the road. The side opposite the woods is farm field void of any buildings. Gramps walked with traffic in the dark. On this night a car came up behind him, and hit him. It dragged him for three hundred feet before the driver stopped. Fortunately, the driver sought help. An ambulance took him to the closest hospital in Ann Arbor, Michigan; a hundred and fifty miles away. I was eight years old, and I remember mom getting a call at our home in Chicago. It was the hospital; her father was critical, and not expected to survive. Mom talked it over with dad, and left for Ann Arbor, by train, the next day. She stayed as long as she could and came home after a week. She expected to receive a call that he passed away. Mom was very upset, and cried allot. A week later I came home from school, and who was sitting there, but my seventy-two year old grandfather. He had a lot of abrasions on his arms, legs, and head. Otherwise, he looked good. Gramps told us that the doctors were planning to experiment on him, and he had to get out of there. He kept repeating over, and over that they were planning to kill him. He survived for many more years, but did have a skin problem after that. We often saw him applying hot wet cloths soaked in boric acid solution to his arms and legs. He always blamed his itching skin on that accident.